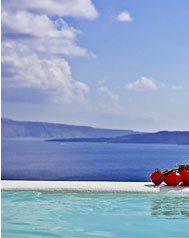 Residence Suites is situated in the picturesque artists village of Oia, built on the edge of the Caldera Cliffs. It offers an Exclusive Collection of Suites & Studios. At the top of the cliff in the heart of Oia village surrounded by charming blue domed churches, in an exclusive residential neighbourhood of private homes, one can find Residence Suites. An Exclusive Collection of individually decorated Studios & Suites, this hotel in Santorini is designed with 'State of the Art' comfort and opulence - a blend of traditional and modern architecture. 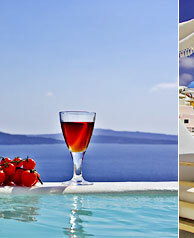 Over a Glass of fine Santorini wine, gaze at the deep blue of the Aegean sea. 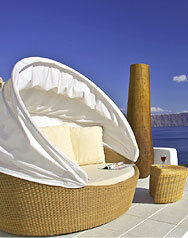 Capture forever in your mind the magnificence of Santorini, an inspiration to poets and painters worldwide.